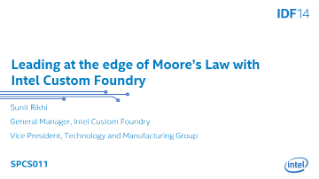 Intel Custom Foundry GM Sunit Rikhi discusses the custom business models, worldwide manufacturing assets, design platform offerings, and Intel’s Integrated Device Manufacturing capabilities that assist customers in leading at the edge of Moore’s Law. Intel's Babak Sabi shares how Embedded Multi-die Interconnect Bridge provides solutions for high-speed chip communication. Intel 3-D transistors manufactured at 22 nm ensure the pace of technology advancement for years to come. See how the new transistor process and tri-gate fin design enable greater computing experiences. Follow the computer chip making process using Intel's 22 nm technology with 3-D transistors. Intel Custom Foundry & Synopsys, Inc.